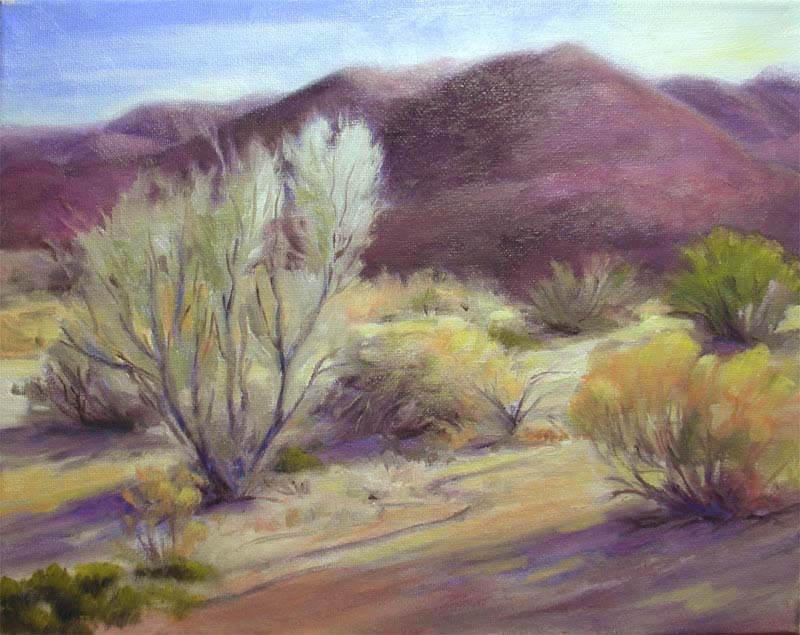 Painting the desert as seen in morning light is definitely a challenge. The air is remarkably crisp and clear, probably clearer and with less particulate material than just about anywhere I’ve seen. So that’s a distinctive look that says “desert.” But this is in contrast to one of the principles of landscape painting that tells us that distant objects should be softer, grayer, bluer and with less distinct detail. I could have painted this painting that way .. “pushing back” the mountains with desaturation and adding more blue. But this time I chose to keep them darker, almost close enough to touch. This alluvial area comes out of the San Jacinto Mountains. I believe it’s an area along the Randall Henderson Trail, but I’m not certain. I really need to take better notes about my locations. This painting was done using only three colors, black and white: ultramarine blue, cadmium yellow light and alizarin crimson. I feel that the limited palette can help to create greater color harmony. It was an experiment and I like the results. Some very wise teachers advocate using a full palette with perhaps two dozen colors, many premixed, so that you can quickly select the right color when time is short. There is definitely an advantage to working that way, speed being a major concern. But other good painters say that you can get more color harmony if you limit your colors and just mix like crazy. I know one demo painter that only uses about seven colors on his palette on location. Another teacher, John Cosby, challenges his students to paint with just five. So there are a lot of different things to explore and learn from. I may be taking this painting with me to the show at Descanso. Now I’m down to the wire deciding on the right mix of subject matter, size, color, medium and so forth. Although I’m restricted to bringing 20 paintings, if you’re coming to the show and would like to see something else that I’ve featured here or on my website, drop me a note and make sure I have it available for viewing in person. Absolutely love your colour choices in this one!